This rate of expansion might seem unreasonable but it is in fact slower than China's rate of expansion during much of the previous decade. 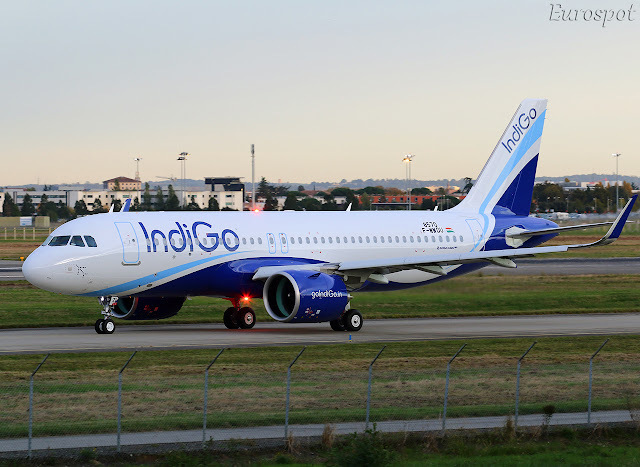 CAPA Research: Increase in international capacity share is driven by Indian carrier expansion, led by IndiGo, which accounted for 57% of the total additional weekly seats, and 75% of additional seats by Indian carriers. Though I don't agree with the policy per-se, the present government's protectionist policy with respect to bilateral seats to the Gulf and SEA carriers - against the previous government's bilaterals-for-cash regime - has benefited Indian carriers a lot. China's economy grew quicker. Aviation demand is driven by economic demand (fly to go sign contracts or tourism). Growth to rebound to 7.3 percent in FY19 and 7.5 percent in FY20 with the effects of twin shocks of demonetisation and goods and services tax implementation fading. Inflation to average close to 4.9 percent in FY19. I believe India will be the fastest growing market over the next 15 years, but that doesn't mean airlines cannot over-expand. Every airline in India is losing money. Indigo and Spicejet have a profit margin of about -10%. Jet and Air India at -23% based off the last quarterly reports (last annual for Air India, so I expect much worse this year). If you look at my prior posts, I was advocating fast growth. I was wrong. Note: I still thing the market needs to grow, but closer to the economic growth rate (somewhere in the 7% to 10% range). China also has a huge bullet train network, and trains in India are simply poor. It takes atleast 15 hours to travel Delhi-Mumbai. This could be one reason why eventually with slightly lesser economic growth, India may see higher growth in air traffic. I suppose you mean: That doesn't mean airlines can overexpand. Too many aircraft and routes now cause problems later. Of course, 9W is exempt from this statement, since it is rapidly slashing routes. I suppose you mean the following. That doesn't mean airlines can overexpand. Too many aircraft and routes now cause problems later. Of course, 9W is exempt from this statement, since it is rapidly slashing routes. The growth in India would be much lesser if fares were more realistic and relevant to the cost structure of the industry. They keep fares low, much below cost base, sometimes dirt cheap, fill up planes and say there is high growth and demand. It's like reducing rates of iPhone to $100 in India and saying there is 500% growth. Which is artificial growth. And saying there is huge demand in the country. Airlines themselves claim that if they were to increase airfares to reflect rising costs like of fuel and currency depreciation, they would see a drop in demand as it's a very price sensitive country. Even though they have introduced fuel surcharge, the overall fare has still been kept almost same as before . A more reasonable growth rate of airlines in terms of addition of seat capacity should be at ~10% even if at a higher fare for pax. All LCCs were profitable upto Q1 of this year before oil price shot up. With oil prices going down profitability will return. India remains a very very under penetrated air market and the general trend of traffic will be high growth for the next several years. Drop in yields is 100! AI/9W fault. Business that don’t pay for aircraft, fuel, employees and so forth should not be in business. Bulk of 6G expansion is at airports/routes where neither of AI or 9W would have flown. If anything 6G is contributing to improved productivity of the Indian economy. To ease the slot constraint in Delhi airport, Hindon Air Force Station serve as the “second” airport by February next year. Flights to Jaisalmer, Gorakhpur, Allahabad and Kannur will take off from the newly built civil terminal of Hindon Air Force Station. Dutta was with United Airlines for 17 years and remained its president between 1999 and 2002. 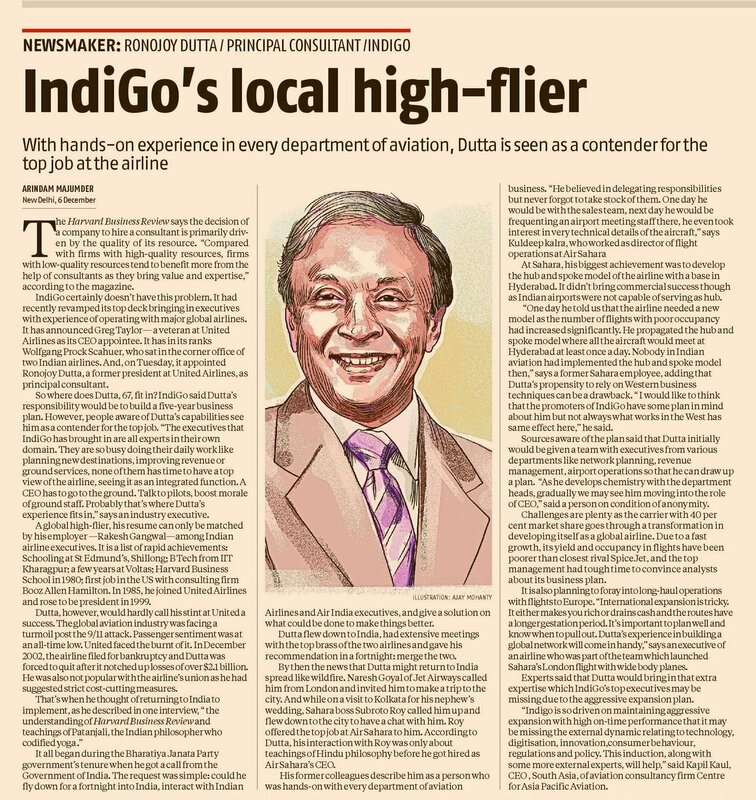 He was once a colleague of IndiGo co-founder Rakesh Gangwal, who was with the airline between 1984 and 1994, before moving to US Airways, where Dutta later became a strategic adviser and member of the board. Dutta headed Air Sahara from 2004 to 2006 and quit just before its takeover by Jet Airways. The journo certainly can't mean Kannur! He means Kanpur. I doubt Hindon can support an aircraft like the A320 which has the legs to fly to Kerala. Well yeah, sure! Hindon will only have RCS flights and Kannur won't exactly be a part of that.. Personally, I would never go for any flight from hindon. It's located in Ghaziabad, over 50 Kms away from New Delhi area, with absolutely no metro connectivity. GoAir will be flying a special 1 off flight to Kannur on 09DEC. The routing will be BLR-CNN-TRV-BLR. Looks like all the airlines are super excited about Kannur opening, that they all jumping in to start ops immediately. Wonder how they will all race into Navi Mumbai Aiport when it opens. 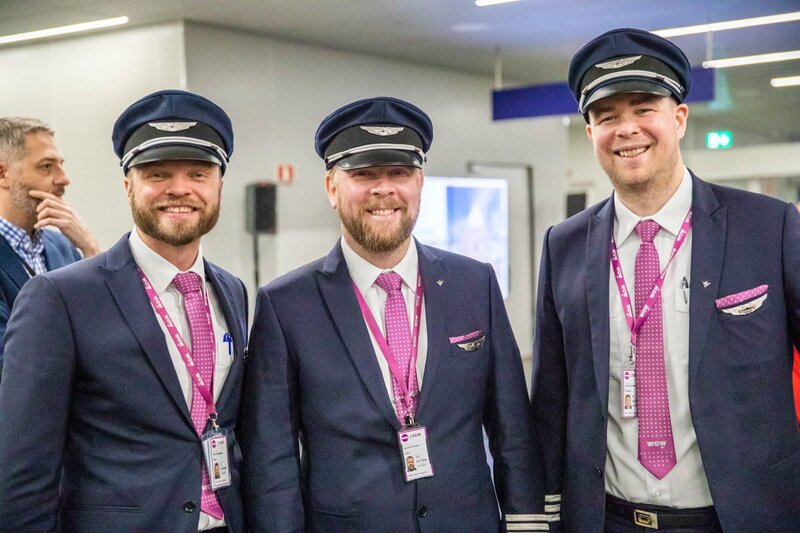 Most of these new flights will be operated by IndiGo and a couple of small and new players. India leads Asia Pacific passenger traffic growth in September. India led the increase within its region, with a +14% year-on-year rise in passenger traffic, including a surge of +25.8% in Bangalore and +10.7% growth in Delhi. I saw this article but didn't quite understand it. Those new flights are for what period? Weekly? Nevertheless, Kanpur is underserved. SG is the only operator there. A flight to Hindon might have been on the cards. Still, good to see that CNN (Kannur) is building up its fair share of domestic routes, unlike CCJ, which underscores the belief that Malayalis travel only to the Gulf and nowhere else. Air India Mumbai-NYC flight begins today, taking off from BOM in coming minutes. While this route may personally be beneficial for me, I am not too sure if it can survive in the long run. For whatever reason Mumbai-US has been difficult for AI, and they had to cancel a past BOM-JFK and BOM-FRA-ORD (both of which would theoretically make excellent routes). Of additional note is that they are flying 3x 77W. Why not daily 77L since it won't be weight restricted and a business population may prefer the daily services by UA (across the river) and numerous other 1-stop options? AI would have been better off with DEL-LAX IMO. The time savings of nonstop India-NA west coast are much greater than to the east coast, especially considering that the US west coast is actually further from ME3 hubs than DEL itself. Anecdotally, it seems BOM passengers generally prefer 9W over AI. However, considering the large increase in people of Indian origin across USA since the last time AI looked at the NYC area (and no I am not considering the ill-advised AMD-LHR-EWR flight), and that AI is generally preferred for a specific subset of VFR (elderly parents), AI might be able to make this work, especially if they can get their domestic connection bank through BOM working as "smoothly" as DEL. The 3x weekly seems to be the SOP for AI to start new flights to the US, I suspect because AI is still not comfortable flying 77Ws to the US. See AI103/104 for example. DEL-LAX would be very beneficial for me, and the general success of DEL-SFO indicates that AI might be able to make that work, but we have to understand that Southern California is significantly smaller than the Bay Area in terms of potential passengers of Indian-origin. Without connections to the Northwest and the Mountain West, AI might not be able to make it work. Perhaps as Netflix and Amazon Video scale up in India, there will be some additional J class demand to warrant a BOM-LAX flight instead. Does anybody have any insight into how the DEL-IAD flight is doing? Considering the DelMarVa area has slightly larger number of persons of Indian origin than SoCal, the success or failure of the DEL-IAD route might point towards whether AI will consider LAX-DEL/BOM sometime in the future. In the past AI couldn't make JFK BOM work because of their own faults. The ORD flight did well but was cut because of transfer of hub. Anyways AI already provides a daily to EWR so now it's a 10 weekly to NYC. DEL LAX IMO will be good only with a 789 or at the max a 77L. It wouldn't have worked with 77W . They don't have 789s unfortunately. The board unwisely refused to convert the last 6 788s to 789s. Is it too soon to start asking about AI 777 replacements? Keeping in mind that the oldest frames are over 10 years old, and any comparable replacements would have at least 8-10 year backlogs? My vote is for a subfleet of A35Ks (now that Airbus has extended the range). Even I wonder what AI would replace these 777s by. But before that, they desperately need more narrow bodies to remain relevant in India unless their strategy is to only offer domestic connections from DEL/BOM. I do not understand why AI cannot increase utilization on their 777s by starting a noon departure to US. I had posted this earlier as well. This rotation would need 3 frames and would align perfectly with AIs European bank. If the US nonstops are making money, does it make sense for AI to lease few 77Ws to expand more, I am sure they can get few ex EK birds for a good price. I wouldn't mind AI restricting itself to International routes and corresponding 3x daily metro connections. Domestically, apart from the BOM-DEL and possibly the CCU-DEL cash cows, I don't think it would be a good business case for AI to get into a scrap with 6E. IX can do its thing (Gulf-Kerala) and 9I can get into the UDAN market. Refurbish the interiors (they should have had a plan to refurb interiors every 6-8 years anyway) and let the LCCs fight 6E, no point hemorrhaging cash there. PS: I am not suggesting DEL to other metros cannot be cash cows, it's just that AI has already surrendered the markets and AI has an uphill battle to get back into those markets. 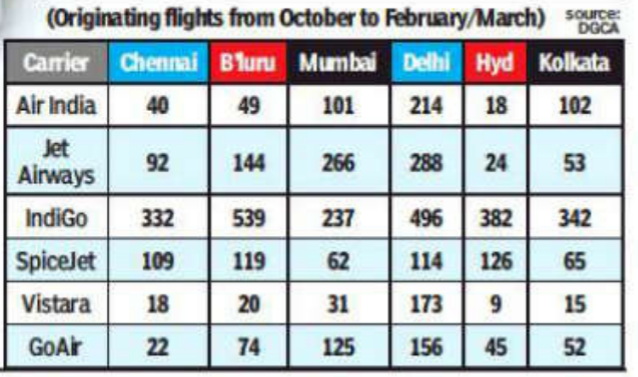 This plain to see from the number of AI flights between DEL, BOM and CCU. I think the Indian airports thread had some stats that support this assertion. Last edited by devmapper on Thu Dec 06, 2018 10:41 pm, edited 1 time in total. Anecdotally, it seems BOM passengers generally prefer 9W over AI. The success or failure of the DEL-IAD route might point towards whether AI will consider LAX-DEL/BOM sometime in the future. No doubt about that, I am happy that a BOM - JFK flight has started but well I have had enough bad experiences with AI before that I totally avoid them, last time I flew AI was 8 years ago. I don't think so the B77W would be replaced anytime soon, AI will keep them at least for the next 8 to 10 years, the replacement for them would be B777X or B787-10ER if that gets launched by that time or well if Air India survives by that time. AI is hardly going to be able to order max 15 frames (assuming a like-for-like replacement) today and get delivery dates for either 359/K or 789 before 2025 anyway. By that time the oldest frames in the 777 fleet would be 18-19 years old anyway. And yes, those are the only two possibilities for AI to replace the 777 fleet. The 778 is optimized for longer ranges and the 779 is too large a plane for AI even 10 years into the future. The 77X also hasn't flown yet, so we don't know how engine performance is going to be especially out of BOM. I don't think the 78J-ER is going to be announced far less be available for order because Boeing is in a fight for its life with the 797. That's not a ding against Boeing, it's just how good the A320 series is, since I expect the 797 to eventually replace the 737. Anyway, back to Indian Aviation. The last thing AI needs to do right now is go on a shopping spree at the cost of the Indian taxpayer, particularly given the fact that they (the taxpayers) are still paying for the last one! Their 777 utilization is erratic at best..eg., they routinely keep switching between the 77W & 77L on both the SFO flights and there is absolutely no pattern there. As has been discussed before multiple times, with 2 T7 frames projected to go on AI1 duty, they will need the others eventually (the 744s are 1997ish I think) so someone's gotta do all those Saudi runs. The best case scenario for Indian taxpayers is the selling of non core assets of Air India to reduce non aircraft related debt and ultimately selling a leaner airline. The government seems to be moving in this direction after the botched attempt to sell a 75% stake previously. How long will this route last? I thought WOW had dropped their DEL launch plans because of their own financial woes. There were some thread discussing the same too. Doesnt seem wise to have launched this route despite their mess along with aircraft shortage. 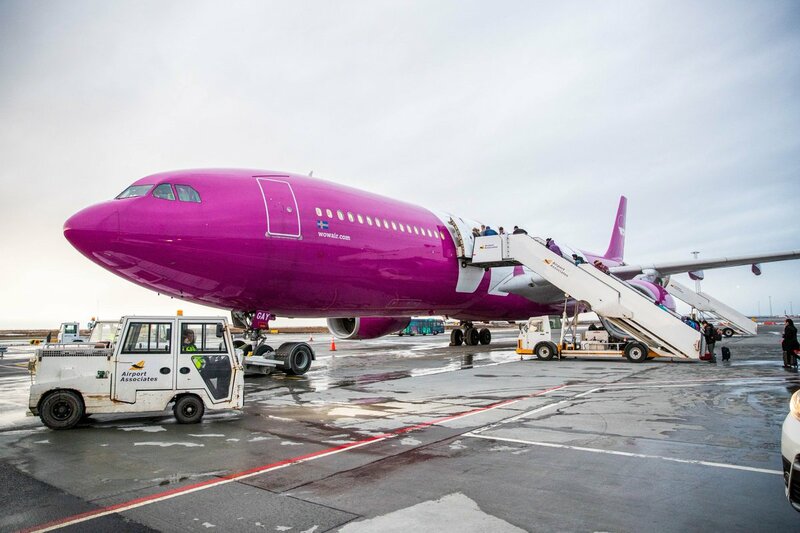 Apparantly WOW Air is axing DEL along with many other routes sometime in February as they are in trouble if my memory serves me right. Read somewhere in the forums but looks to have disappeared. Can't find the source anymore either. 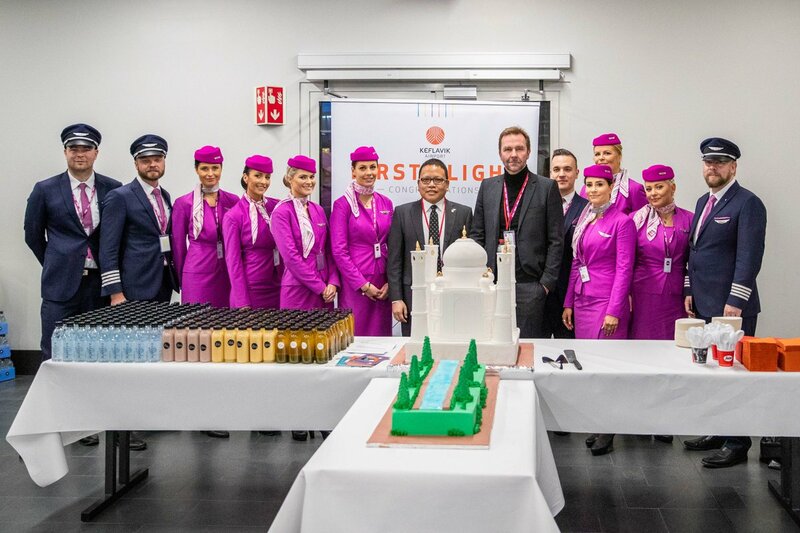 Isn't having a launch ceremony for a flight whose closure has already been announced quite strange? The pictures look lovely though! This year the lowest USA-India promotional fare I have seen is $429 RT. NYC/LAX-India routes seem to be winning the race to the bottom. Yes, it is an anecdotal example but in general, there is no money to be made. Difficult even for a ULCC, let alone Delta. AI seems to be posturing to make LHR its European hub. They made an interesting statement that they will start MAA-LHR and HYD-LHR in a year. If 9W still not out the woods at that time, DL+VS and Air India should start interlining at LHR. Why not daily 77L since it won't be weight restricted and a business population may prefer the daily services by UA (across the river) and numerous other 1-stop options? FWIW AI is using the high MTOW 77W (777-333), for BOM-JFK. Today's flight was on VT-ALX and it seems that the airline has assigned this aircraft to the route for the next couple days too. Wheels up to touch down today was 16 hours flat, or approximately 1 hour longer than even DEL-SFO. There was talk on some Twitter threads that the plane may have to refuel due to the distance. This route is actually longer (by Great Circle) than DEL-SFO by about 160km, even though it would intuitively make sense that DEL-SFO is significantly longer. BOM-JFK also has the disadvantage of facing headwinds nearly the entire way to JFK, as the GC route is not as polar as the DEL routes. AI really need to consider to extend this flight to AMD, to fill BOM-AMD capacity and since there is a big GJ population in the NY area. One thing that I find interesting is that Indian media are quoting AI that this they will have "Mumbai to New York operations for the first time ever," even though this route was run in 2008-10. I don't think AI has any more rights for more flights to LHR. Both AI and 9W have rights for 28 weeklies to LHR which both have exhausted . ( A reason why 9W couldn't launch BLR LHR ). Moreover as today, domestic and int'l ops at BOM are at same terminal , there's little requirement for special int'l connector WB ops in domestic . AI ran 744s in BOM-AMD route during the 90s and early 2000s which continued to their EWR flight but at that time people had to switch terminals at BOM for int'l to domestic. Are they so lazy that they need the same WB to fly them to their final local destination? How difficult is it to walk to another plane in the same terminal. I see AI does this a lot for AMD and Punjab flights . Keep in mind too that many of these US flights are used by large amount of elderly (wheelchair) population, so it is more difficult to transfer them than a general passenger.